To witness the dazzling royal court at the Palace of Versailles must have been a singular most enthralling experience. Imagine the traditional grand balls in the glorious Hall of Mirrors, with the nobility and courtiers magnificently dressed in the finest and most expensive regalia. Who would have thrown such splendid celebrations in a setting considered to be the symbol of power and influence of the French monarchy? – It’s no other than Marie Antoinette, the style icon of the 1800s, who to this day remains a sartorial influence, and calls to mind thoughts of grandeur and wealth just by the mention of her name. Sienna Dream Tinio’s birth is an answered prayer… a dream come true for her mom and dad. And because they’re celebrating her first birthday, her parents spared no expense to throw a sumptuous party ala Marie Antoinette for the family’s one and only princess. 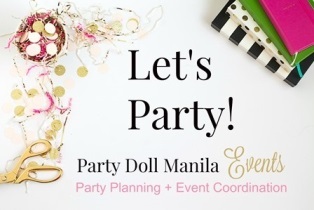 Premier party planners, Teena Barretto and Bespoke Manila bring together the best of the best from decorations and design, to catering, entertainment and giveaways. Style whiz, Gideon Hermosa and his team, worked with Party Station to transform the party venue into a palace ballroom that mirrors the splendor of Galerie des Glaces. Sienna can look back to this all important event in her life with the brilliant photos by Nice Print. The first thing that greets the guests is a collage of Sienna’s photos from birth to twelve months old. From here onwards, the walk to the entrance is a gallery featuring memorable items in Sienna’s precious life. This gallery ends with an impressive floral arch of white and pale pink roses. Guests then enter an anteroom filled with candelabra and decked with beautiful flower arrangements and an ornate ceiling of white lace umbrellas. Guests enter the main hall, through a second floral arch of hydrangeas, orchids and baby’s breath. A luxurious ceiling decked with thick clusters of pink and white balloons, garlands of flowers, more white lace parasols and chandeliers with glistening cut crystals evokes the opulence of 17th century French royal court. It’s simply sublime, and almost even magical. All lights are on the center stage and an LED screen displays the gilded monogram “S” for Sienna, the brightest star in this spectacular birthday bash. A towering arrangement of pink and white roses in the shape of a long-stemmed wineglass topped with some ostrich plumes, a gold crown ornament, gold and crystal candle holders and porcelain tea cups adorn the tables. For Sienna’s young guests, smaller tables draped with silky pink cloth and decked with pretty flowers are arranged closer to the stage. Let them eat cake! While most one-year-olds would celebrate with one birthday cake, Sienna’s doting parents upped the ante with eight fabulous cakes, each one more stunning than the other. The expertise and creative genius that went into baking and decorating the cakes is evident in the elaborate and meticulous designs. The gallery of cakes might be entitled “A Life in Objects” – featuring things that the Dauphine loved – a corset with silk ribbons, a ball gown with the widest crinoline, the royal boudoir, and a porcelain tea set. Madison Events put on a good show for the guests. The children were thrilled and their parents were equally impressed with the singing Disney princesses and a remarkable dance number by talented young ballerinas. Apart from the scrumptious courses served by the caterers, Sienna’s guests also enjoyed a variety of treats like sushi from the Ta Ke Ho Me stand, a choice of nachos, fries and fish balls offered by Las Hermanas, beverages from Hendrick’s and more. There’s a “bead buffet” that will keep the youngsters busy designing their own bracelets and necklaces using the colors and beads they like. Could this have been a “not-so-little” coffee nook in Marie Antoinette’s Petit Trianon at Versailles? This photowall could surely pass for one. Guests are most certain to take a photo or two here that will be remembered even long after the party is over. At the end of this fabulous gem of a party, the birthday celebrant sends her guests home with awesome giveaways like gourmet soap and perfumes by Eunoia, notepads and a bag with Sienna’s gilded monogram, keychains and other fun stuff. Sienna is a dream come true for a family where blessings abound as deep as their love. As her future unfolds and her own dreams open up within her reach, her family will be right there with her. Happiest birthday, Sienna!